The other day, a friend invited me to join her on a walk in Cedar Grove Park, a beautiful expanse that I’d passed once while driv ing but hadn’t yet made time to visit. We pulled into the ample parking lot, made a quick stop in the immaculate restroom, wandered over to the pristine bocce ball courts and playground, and all I could think was: Why isn’t anyone here? We were not completely alone. There were a few runners and a mom with her toddler on the swings. But if we’d been at Brookdale Park on this sunny morning, there would have been people everywhere. True, it was a weekday and the park is relatively new – only just completed in 2016 – but I started wondering how long it takes a public space like this one, slightly tucked away as it is, to become a regular destination. 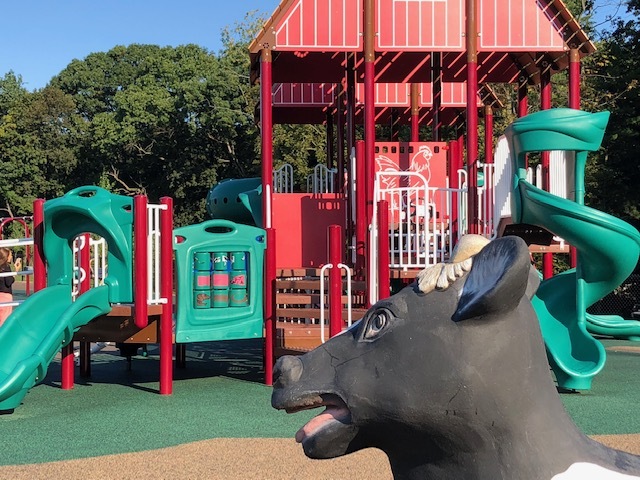 I lived across from Montclair’s Edgemont Park when its tired, old original playground was renovated into the kid magnet it has become. I remember it taking a little while for people to discover it and make it part of their lives. How long? I don’t recall. But, like Edgemont, there are plenty of reasons to check Essex County's newest park out sooner, rather than later. The park sits on either side of Fairview Avenue, which intersects Bloomfield Ave in Verona. On the east side: bocce ball courts, all-access playground, and club house – all brand new and all designed with plenty of shaded areas to sit. Beyond the parking lot (also on the east side) there’s a paved walking path that loops down and around a lovely landscaped hill. On the west side of Fairview Avenue is another walking path that meanders over foot bridges and past little “workout stations.” There’s even a place to enter the woods – we hiked for about 10 minutes on the wide dirt trail up to the top of the hill before turning back. We probably could have gone on for an hour, but we didn’t have the time. Although Cedar Grove Park is not a park that many can walk to, it's a wonderful environment to walk in. I also noticed a sign for a Farmer’s Market - Tuesdays from 10am - 3pm.! If you’re a runner, cyclist, or just like being outdoors, I encourage you to stop by. 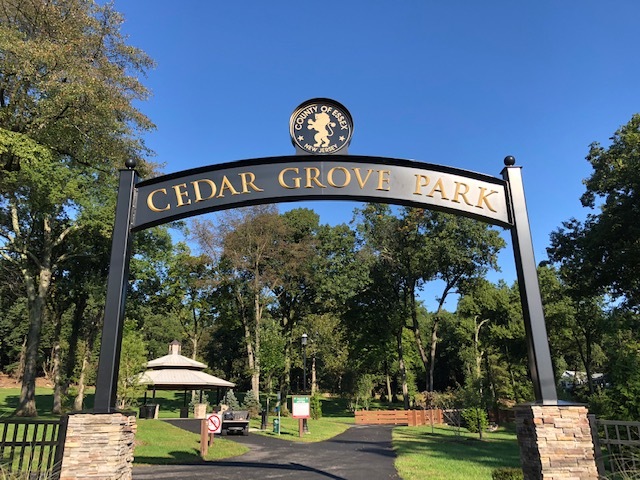 I predict that, like me, your first visit to Cedar Grove Park will certainly not be your last. I live about a mile from the drug store. A post office and a Starbucks are across the street. One block north is one of my favorite gift shops. When I walk "uptown" to run some errands, it absolutely takes more time than if I drive. But the experience is 100 times better. I love looking at people's gardens on my way to do my errands. I'm a sucker for pretty flowers - they remind me to pay attention to what's beautiful in the world. I'm also bound to run into friends or acquaintances on my way there or back. We may not have time to sit and catch up over coffee, but a spontaneous 15-minute chat in front of the firehouse can be almost as soul-filling. Plus, when I walk, my body feels better. Soaking up some sunshine, moving rather than sitting, taking in the fresh air. Turns out all the things my grandmother told me were good for me really are. The medical community says when we're running our errands on bikes or on foot, we're healthier. When I do it, I'm happier. With 7 train stations, myriad bus stops, 5 distinct retail centers and several more smaller clusters of shops, restaurants and services, Montclair offers plenty of opportunities to show up on foot. Wherever you live, there's always somewhere to walk. I'm practically breathless, and it's not from the pollen. May in Montclair is in full bloom and there is truly not enough time in my days for it all. "May in Montclair" is not simply a town during the spring. "May in Montclair" became a "thing," in 1979, when the town first distributed a calendar of events listing everything to see and do. From the Presby Iris Gardens to the blossoming Van Vleck estate, it's a month-long celebration of one of the most beautiful places in New Jersey during one of its most beautiful moments in time. Do I already sound like a commercial? It may get worse. As I write this, we're in the middle of the Montclair Film Festival, a 10-day extravaganza of screenings, discussions and parties that has grown so much since its inception in 2012, it's hard to believe it hasn't been part of May in Montclair forever. There are parent workshops, lectures, lunches, garden tours, walking tours, dance performances, choral performances, cooking demos, book sales, art talks and art walks. And garden events galore! Also, over the next two weekends, the high school is staging Pippen on Friday and Saturday nights. Aside from being a wonderful show, this is a great way for parents to get a sense of the amazing arts education available in the district. There's a bike tour and dining alfresco and Saturday night music on Church Street - and even though that kind of thing happens even in non-May months - well, it just feels more special in May. If you're considering buying here, please spend some of your May in Montclair. It's like seeing our town in its most flattering outfit and having its best possible hair day. I know you know what I'm talking about. Dig in! If you had asked me decades ago, when I first moved to this area, whether a walkable suburb was for everyone, I think I would have said no. I think I'd have assumed that only those of us coming from New York City - the walker's mecca of the U.S. - would have understood and appreciated the benefits of living in an area that is easy to navigate on foot. But it's not just New Yorkers that are walkability lovers anymore. Here are four trends that point to America's communities becoming less reliant on cars. 1. Fewer People Have a Driver's License. From 2000-2014, the number of Americans holding a driver's license has fallen sharply from 91 to 77 percent. 2. Living Without a Car Has Become Easier. Not only have public transportation systems been upgraded and improved in the past two decades, services like Uber and Lyft have made "livery" service more simple, affordable, and reliable, allowing people to bypass car ownership altogether. 3. More People Bike to Work. From 2000 to 2014, the number of people commuting by bicycle has grown 62 percent. More and more, towns are budgeting (or securing grants) for bike safe roads and bike racks as part of "downtown" development. 4.Better Public Transportation Makes Good Business Sense. President Obama recently signed policy to give tax breaks to public transportation entities as well as for those who provide parking near public transportation. If you're looking for a place that is pedestrian and bike friendly, allow me to introduce you our own lovely walkable suburb. Truly the best of both worlds! I've gone through years of outlandish resolutions (lose 25 pounds by February, finish all the half-read books on my nightstand, eat kale at every meal), and I've greeted the New Year with no resolutions at all. But this year, I've thought about how I can take better advantage of this amazing community I live in -- and also how I can give back. Many of my resolutions this year are "walkable" in nature, and they feel absolutely right. It's a list that captures the things that are really important to me -- the perfect recipe for a Happy New Year! o If I'm buying only one bag of groceries, I will ride my bike to Acme rather than take the car. o If it's not raining (or snowing!) I will walk to the train station for my trips into New York City. o Rather than drive to the YMCA for my usual 45 minutes on the treadmill, I will walk the 3-mile loop from Edgemont Park, up through Yogi Berra Way, across Highland and down through Anderson Park. o I will grow half the veggies my family consumes between the months of July and October. o Each month, I will make a donation of either time, food or supplies to the Montclair Animal Shelter. Happy Bike and Walk To School Day! The other day, I was on Valley Road, one of Montclair's main streets, and there was a dad on a bike shepherding two little boys on their own bikes. Valley is a busy street and my stomach clenched a bit when I saw this. I was concerned that they wouldn't be safe. But then something happened that really warmed my heart. The car behind the riders slowed and began shepherding all three of them. I stood on the sidewalk and watched as the car provided safe passage all the way to the intersection, where the three turned off onto less busy thoroughfares. It's great to live in a town that is easily bikeable and walkable, but Montclair can feel like a city in many ways, so getting from "here to there" on a bike is often a strategic endeavor, just as it would be in any city. That's why this morning, when I saw the park path full of painted bike stencils, guiding kids along the safest routes for Walk & Bike to School Day, it reminded me of all the work that's been done to develop bike-friendly routes for kids. Montclair is famous for its magnet school system - seven elementary schools throughout town, each with a different theme, from performing arts to science to the state's only public Montessori-based school. As a result, many kids ride a school bus. But Bike&Walk Montclair, our local ped-friendly advocacy organization, has worked tirelessly to promote Safe Routes to School and provide loads of sturdy bike racks once you get there. An article on the Bike&Walk Montclair website this week reflects on how many more kids are biking to school these days, something we all seem to support as a community. I love that we have a group like this working to make streets safer for everyone. Because in a vibrant, active town like this, biking should always be an option. This Saturday (August 15) is the Montclair Jazz Festival, an all-day music-fest that takes place at Nishuane Park. This rain-or-shine event includes performances by Jose James, The Paquito D'Rivera Quintet and The Christian McBride Big Band as well as many other ensembles and big bands. People show up at noon with blankets and lawn chairs and spend a little or a lot of time taking in one of Montclair's most valuable offerings - a long-standing, unwavering dedication to bringing live music into the community. If you're around on Saturday, I urge you to check it out. It runs noon to 9pm and truly is one of the many events that sets Montclair apart as a satellite cultural mecca. Police Ticket Bikers in Montclair! I guess it goes without saying that a walkable town is also a bikeable town, but there are things a town can do to make biking easier and safer, and Montclair keeps doing them. Community group Bike and W alk Montclair recently worked to install new bike racks at the train stations and throughout shopping districts, and this summer they have been packed with bikes. Bike and Walk Montclair also advocated for a Complete Streets policy in town, which makes sure that roadway design can safely accommodate cyclists. They run safety workshops, a Safe Routes to School program and just generally make biking in town better and more fun. In September, they will host Montclair's first Open Streets Event, closing down specific areas to car traffic so people can bike, skate, (and dance!) in the streets. Recently, I discovered this awesome thing: Over six weeks of this summer (July 13 through August 31), kids who get "caught" wearing a helmet while biking or skateboarding around town may receive a "ticket" from the Montclair Police Department! The officer pulls them over and gives them a ticket that entitles them to a free tasty treat from one of four participating local eateries. The tickets are given out at random, whenever an officer sees a kid on his beat exhibiting safety practices. Tickets are redeemable at Tiny Elephant, Montclair Bread Company, Cakeaholic Obsession and Little Daisy Bake Shop. (Yum!!!) The whole thing is the brainchild of Tracey Diamond, a local designer who liked the idea of a reward program for kids who travel safely. Even kids in bike seats! Sadly, I cannot pass for a kid anymore, which is too bad because, between you and me, anyplace that calls itself Cakeaholic Obsession has my name written all over it! Bodhisattva is just one of my family's rescued cats. At the moment we have five (though two are just staying temporarily as foster kitties). I don't consider myself "that cat lady," but I do have a soft spot for animals that need new families. Last week, when Keller Williams held their annual day of community volunteering, it's no surprise that I chose donate my time to the Montclair Animal Shelter. One of my five furry friends came from there and I know so many people in town who consider that their first stop if they want to expand their family. As a longtime resident of Montclair, I've always thought of my town as a very friendly community. Apparently the U.S. Department of Transportation thinks so too; Montclair was just designated a Silver Level Walk Friendly Community by the DOT's Pedestrian and Bicycle Information Center. Walk Friendly Communities is a nationwide program honoring communities which have made pedestrian safety and convenience a priority. With our Safe Routes to School program, traffic-calming projects, and other initiatives, Montclair is definitely pedestrian-friendly. Montclair is also a welcoming town for cyclists: We were recently recognized as a Bronze Level Bike Friendly Community by the League of American Bicyclists. Our major roads all have bike lanes (all? ), and one of the most popular town-wide events for the past 10 years has been the Tour de Montclair, sponsored by Bike & Walk Montclair (BWM took a break this year but plans to bring back the Tour in 2014). You might be wondering why any of this matters. Well, the way I see it, these awards show that Montclair is a town that values the environment (bikes and feet don't spew pollutants into the air) and the health (exercise is great for our physical and mental well-being) of its citizens. Sounds pretty friendly to me.